Heavy sludge drips over every inch of this driving slice of stoner metal. The toad king is indeed alive and well, and he's got some dastardly deeds in store for the dwellers of murky, shadowy places. Crunchy guitars of doom lockstepped with throbbing stabs of toxic bass and banging thuds of percussion dominate the track as an unholy minion of the underworld screeches out gargled incantations of filth in the opening title track of this terrifying triptich. The second offering in this slimy ritual is a lenghty tome of unfortunate, and muddy profanity known as Take the Dead. We are not certain where the dead are being taken, but we do not care to argue with the growling creature that directs the dead to be taken. 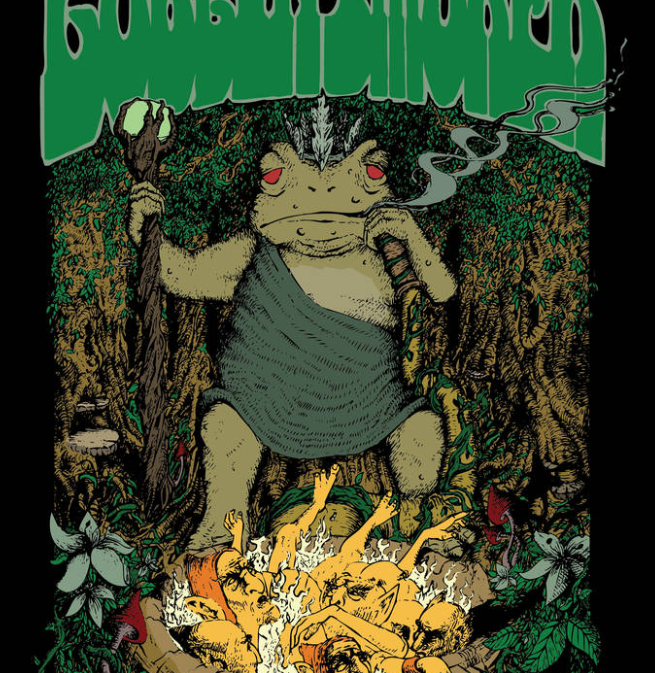 A slowly churning chord progression of psychedelic death echoes across the swampy pits of ruin that the Toad King inhabits, only ordered from chaos by clang and clamor of orc-hammered drums. A inhuman litany of unspeakable deeds is hurled from the witch-mouthed amphibian as the dissoving waves of sludge boil and swirl faster, sweeping up into a funnel of dark, dingy muck. At last, a dank stone door is heaved aside, and in a rank cave filled with toadlings, a dark ceremony begins in the track Time to Ride. The hideous creatures gather their ill-begotten powers to mount a new offensive, screaming into the night sky that "The time has come." As the final driving pulse of rotten metal surges in intensity, the Toad King laughs manically and orders his murderous army to march upon the unsuspecting inhabitants of the earth. Newer Post[Album of the Month] VINYL DIAL - "Space Wizard"
Older PostMISTER DIZZY - "LoVape"